Professional Commercial Health Club Rower. 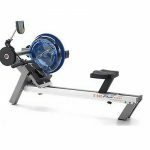 The E-520 Fluid Rower is the closest thing to real, on-water rowing with a natural catch and resistance through the stroke! Plus, it has unmatched durability! The new, unique and technologically advanced E-520 Fluid Rower by First Degree Fitness is one of a family of superb Gym Equipment that has revolutionized the way people exercise in Ireland and all over the World. This First Degree Fluid Rower is a fabulous exercise machine that effectively engages almost every muscles in the human body. All commercial machines in the Evolution Series (except E-216 Rower) utilise the new Interactive Performance Monitor. The Interactive Performance Monitor (IPM) displays: time; speed; distance; revolutions per minute; calories per hour; watts; level and has a heart rate receiver built in. The IPM gives you quick start, manual programs, interval training, 6 previous workout memories and a unique pacer system guaranteed to challenge and inspire you. The E520 Indoor Rower comes with a unique Heel Support assembly that provides an ergonomic “heels together” layout for user comfort. Plus it has instant one-touch adjustments for foot size. You won’t find a more comfortable rower! The First Degree E520 Fluid Rower uses water as it’s form of resistance. and contributes to a relaxing and comforting workout experience. There’s absolutely no slack, no slippage and no flat spots! Its full on resistance and always there for you at the precise moment you want it! First Degree Fitness warrants that the E-520 Fluid Rower, purchased from an authorized agent, is free from defects in materials and workmanship. First Degree Fitness or its agents will, at their discretion, repair or replace parts that become defective within the warranty period. Mechanical Components (of a non-wearing nature): 2 Year Limited Warranty First Degree Fitness will repair or replace any mechanical component should it fail due to any defect in materials or workmanship within 1 year of the original purchase. First Degree Fitness will repair or replace any component should it fail due to any defect in materials or workmanship within 1 year of the original purchase.